What is Smile Aligner ? Smile Aligner provide a hygienic, convenient and a clear solution to the correction of irregular malaligned teeth without wearing brackets and wires.Smile Aligner is an exciting new, invisible, easy to wear, comfortable and above all affordable orthodontic system. This technique is being used world wide since decades. Popularity is growing at an incredible rate. All you have to do is wear a series of clear wafer thin transparent removable aligners, which gently guide your teeth from their present to the desired position.No-one will ever know that you are aligning your teeth!! We pride ourselves on being a very caring and professional laboratory. We are dedicated to providing a high quality product and service to every patient. We will do everything to ensure that you get that beautiful smile you always desired. 1) Crowding – Teeth overlap each other. 2) Spacing – Gaps between teeth. 3) Overbite – Teeth overlap too much vertically. 4) Overjet – Upper front teeth stick out and protruded. 5) Underbite – Lower teeth extend past the upper front teeth. 6) Crossbite – Upper and lower teeth bite on the wrong side of each other. 7) Openbite – Your teeth do not meet when you bite. 8) Misplaced midline – Center lines of upper and lower teeth don’t align. 1) PREDICTABLE : You can see the treatment results even before your treatment starts. 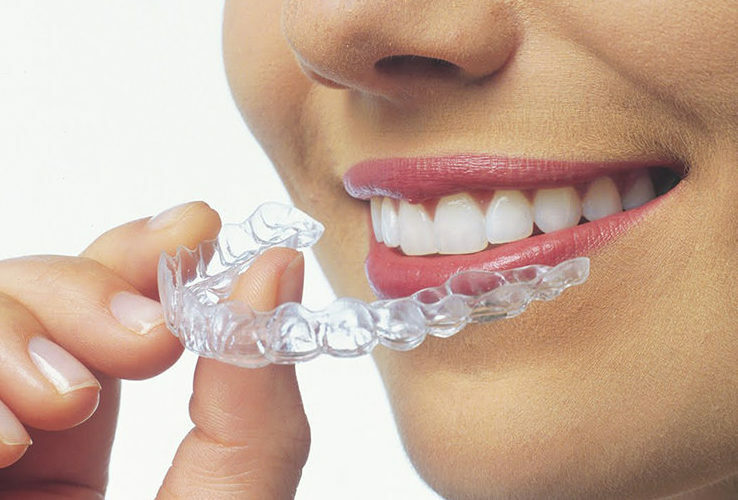 2) CLEAR :Smile aligners are practically invisible, so hardly anyone will ever know that you are aligning your teeth. Smile Aligner provides exciting new improved quality aligners through its unique process. 3) REMOVABLE : You can remove Smile aligners to eat, drink, brush or on special occasions. Smile Aligner is a system of clear aligners that can treat young teenagers as well as adults in their sixties alike. The system has been designed to be flexible to suit individual patient requirements and priorities. The first step in the process is to visit the nearest dentist for consultation. The dentist will take your impressions, photos and radiograph and submit these to Dental Aesthetica Lab. You have the opportunity to review potentially corrected position of your teeth setup which represents the treatment outcome as planned by the dentist. After being satisfied with the review of potentially corrected position, aligners are delivered to you by your dentist on your following visit. Each aligner is worn for week before advancing to the next aligner. Wear the appliance through out the day except when brushing / flossing, eating or drinking hot and cold beverages. Avoid chewing gum / sticky foods and smoking when wearing the appliances as much as possible. Report any potential breakages or cracks in the appliance to your dentist. Brush and clean the appliance using regular tooth brush and paste. Regular brushing and flossing after meals is required to maintain good oral hygiene. Regularly visit your treating dentist for evaluation and consultation. You may feel slight discomfort and some pressure on your teeth while wearing aligners for the first time, this is normal as it applied pressure for correction of malaligned technique. You may experience lisp in your speech initially, which gets corrected over time. 1) Apply balanced pressure on both sides of appliance from front to back teeth when inserting the appliance into your mouth. 2) Apply balanced pressure in the premolar area on both sides of appliance using index fingers of both hands when removing the appliance.